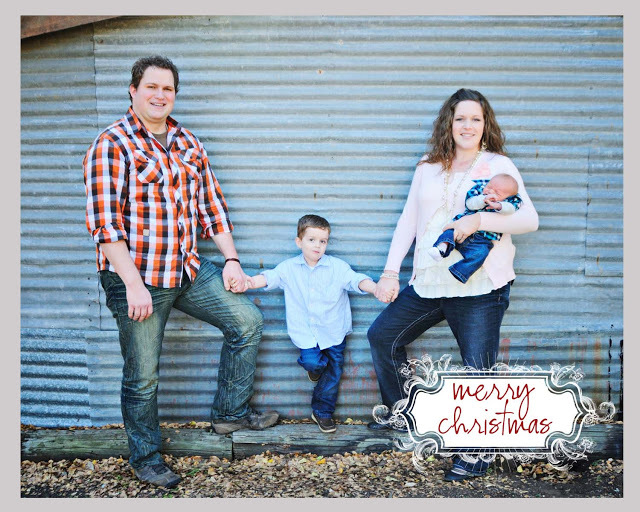 I started a project a few years ago when I was pregnant with my second child. He’s about to turn 4! Am I done? Not even close, but I knew starting it would take me 20 years to finish. I’m hand stitching a 2 inch hexagon quilt from start to finish. Like, legitimately with only a needle and thread! And guess what? I am not a quilter by any means. And that’s okay, because they always follow it up with thinking it’s the coolest idea EVER! 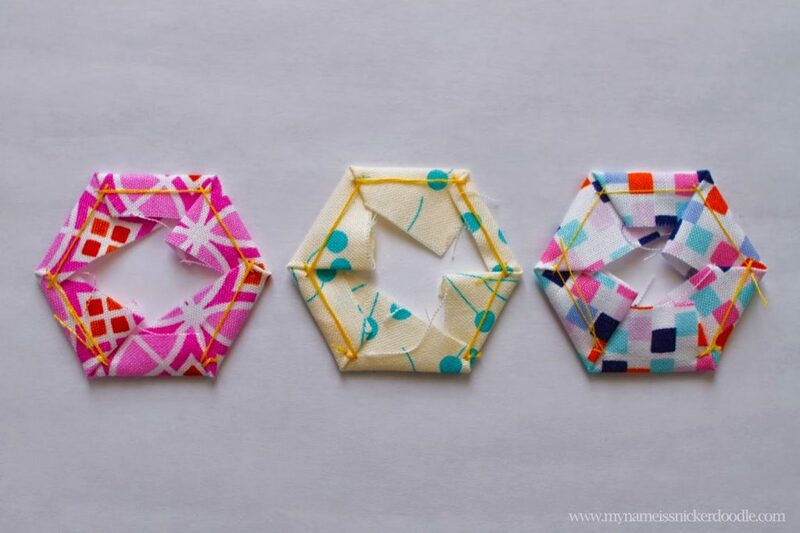 I had seen some hexagon quilts online and absolutely fell in love with the idea. Especially the ones that had no rhyme or reason to them. I had done little to no research and just jumped right in pretending I knew what I was doing. I mean how hard could it be really? Actually, not hard at all! Completely time consuming, yes, but not hard. I did learn a few lessons along the way once I did more research and definitely through trial and error. See, I have a hard time just sitting and watching a movie or show. It’s not like I do that a lot anyways, but when I do, I like to be doing something with my hands. And this seemed like the perfect solution. There are nights (like when my husband and I indulged with watching all 5 seasons of Friday Night Lights for the first time) when I work on it until my fingers are so sore. Then there are times where I don’t sew a stitch for weeks. pile. That way it truly is random and that’s the way I like it! Check out those luscious colors and patterns! It makes me so happy to just look at! I’m sure there are many ways to accomplish this, but here’s what I do. 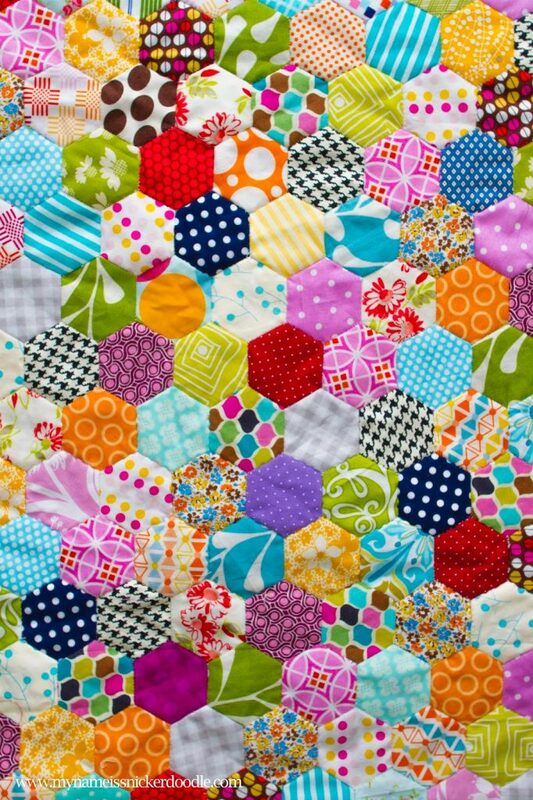 Remember, I’m not a quilter so there are probably actual quilters out there cringing right now! It works great and that’s good enough for me. 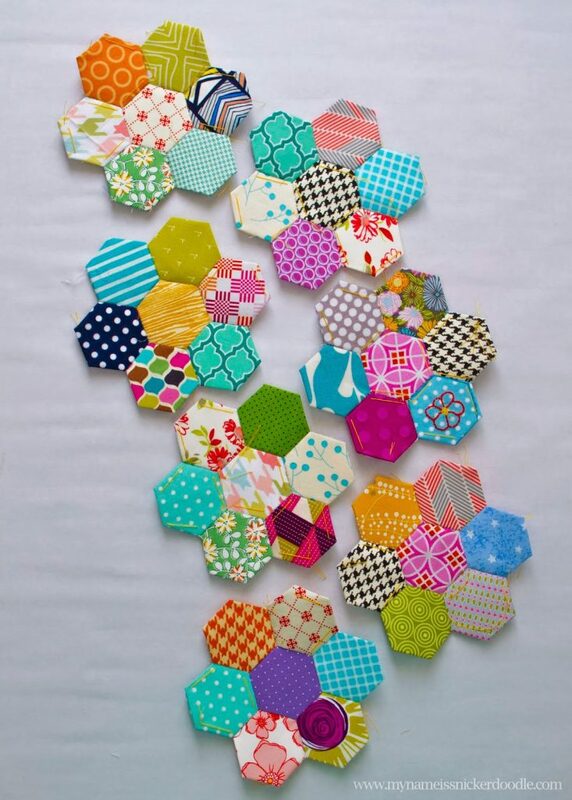 Below you’ll find a free printable for 2 inch hexagons that you’ll print multiples of and cut them out. I just keep them all in a little baggy with my thread and needle. 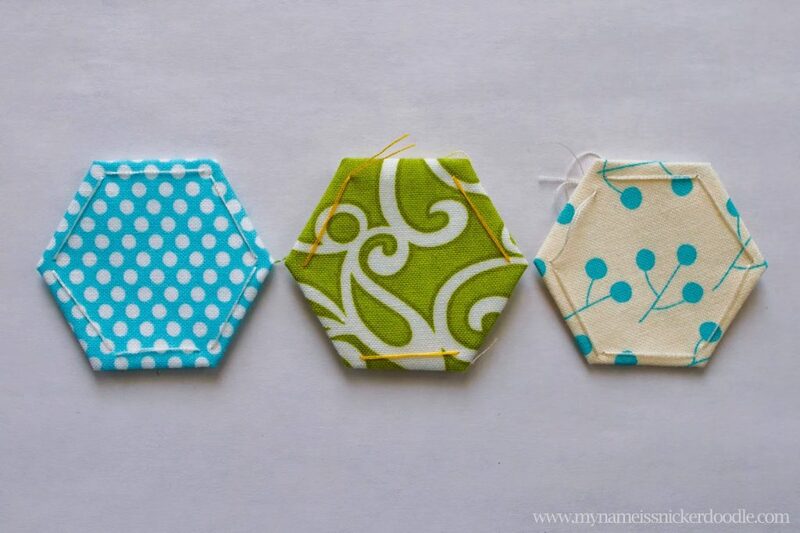 The paper hexagons help keep the shape while you stitch. 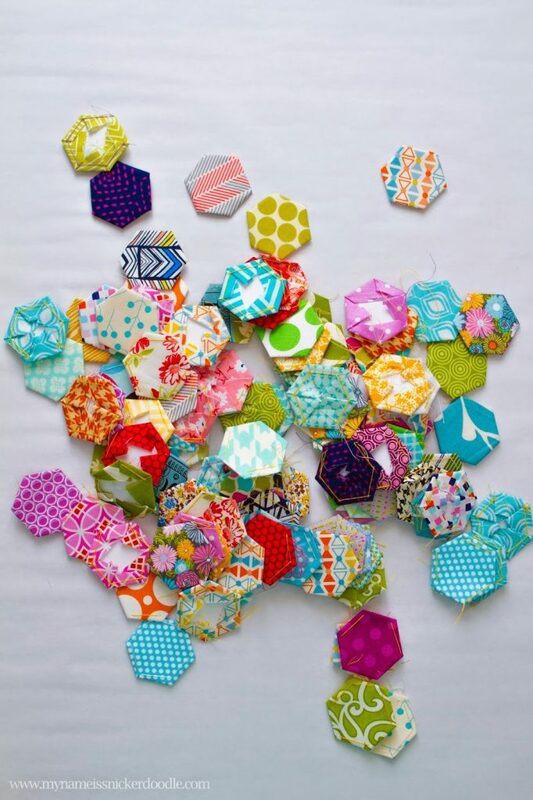 You’ll end up removing them so don’t worry about it being in your finished quilt. I usually keep them in until all sides are stitched to actual quilt. Then I don’t have to worry about it loosing it’s shape. Then, like the picture above, I cut my fabric into 2 1/2 inch squares. Here’s where I learned my lesson that will save me a step in the long run…baste stitch on the back side, not on the front through the paper like below. 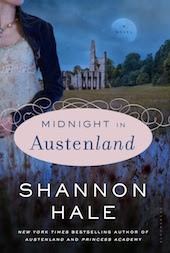 For years I was baste stitching on the front through the paper and then when I’d stitch all sides to my quilt, I’d have to snip that baste stitch and pull it out. If you baste stitch on the back, not through the paper, all you have to worry about is pulling out the paper (once all sides are stitched) and the baste stitch can stay there without being seen. I don’t have a method to my madness. 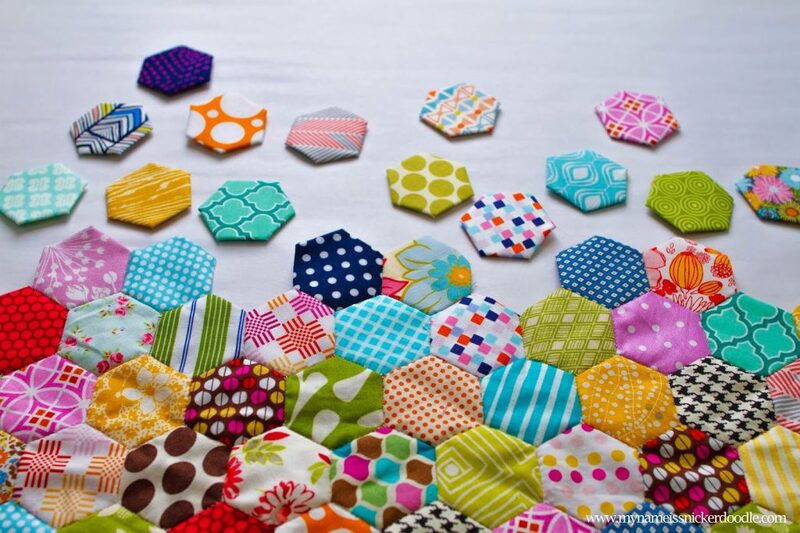 When I feel in the mood to make a million hexagons, I’ll stitch a million. When I get tired of that, I make little “flowers” just for fun. These makes it a bit easier and faster to add to the quilt instead of a row at a time like I was doing before. Lesson #2 learned. When I’m bored of doing “flowers” I’ll start stitching them to my quilt. It’s about the size of a baby blanket right now. My goal is to make it into a full size quilt. Only 15 more years to go…Hahaha! I absolutely love this project so much! I’ve only got discouraged and overwhelmed once through this whole process. I started to think I really was crazy for taking it on, but then I’ll pull it out and feel a huge sense of accomplishment, satisfaction and over all giddiness when I see how gorgeous it is! I would love to see what you come up so stay in contact! 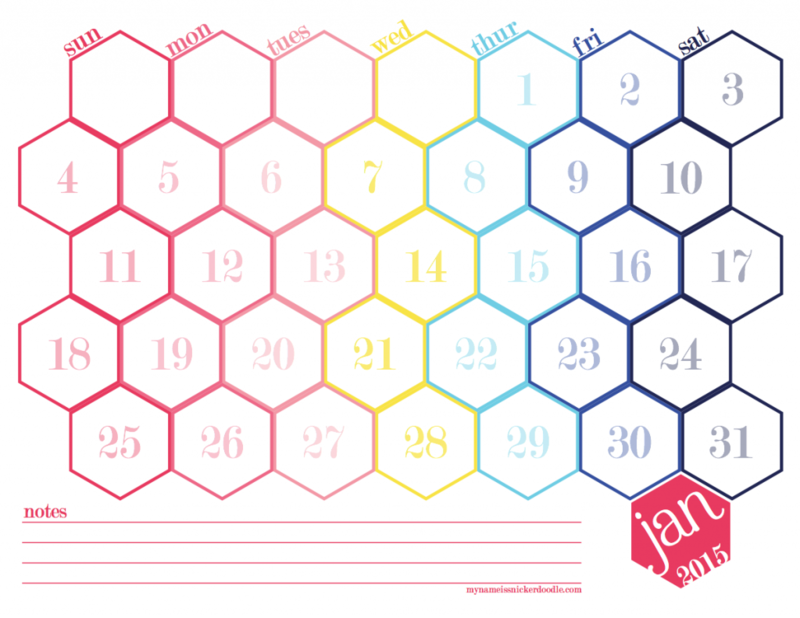 If you like hexagons, check out my printable hexagon 12 month calendar. Would love to see an update on this quilt. 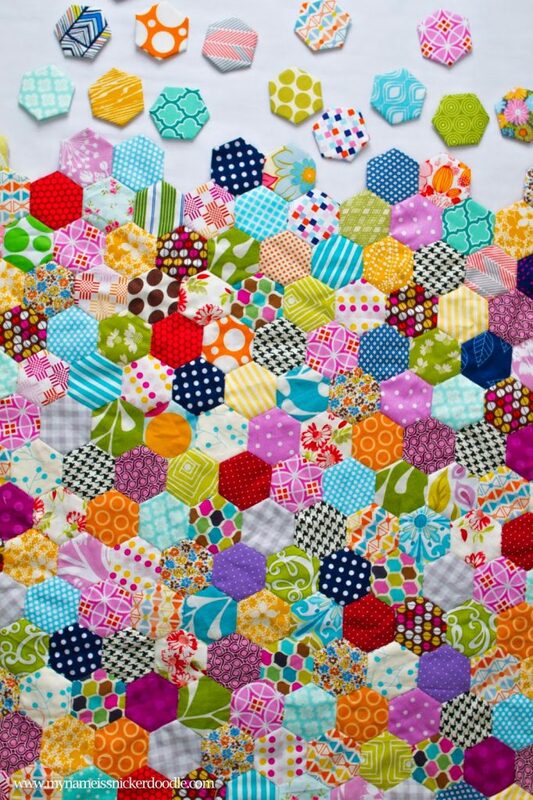 Have just completed a eye-spy baby quilt and have now been inspired to do a long term 2" hexie very big quilt. Hey Amy, how is your blanket going? Can you update your post? You inspired me to use all my collected fabric scrabs to turn them into a beautiful quilt. I started yesterday and already got 130 hexagons 😀 I'm officially addicted! I love the fabric you used – somehow they all fit together. That's my goal aswell! Hey, this is beautiful! 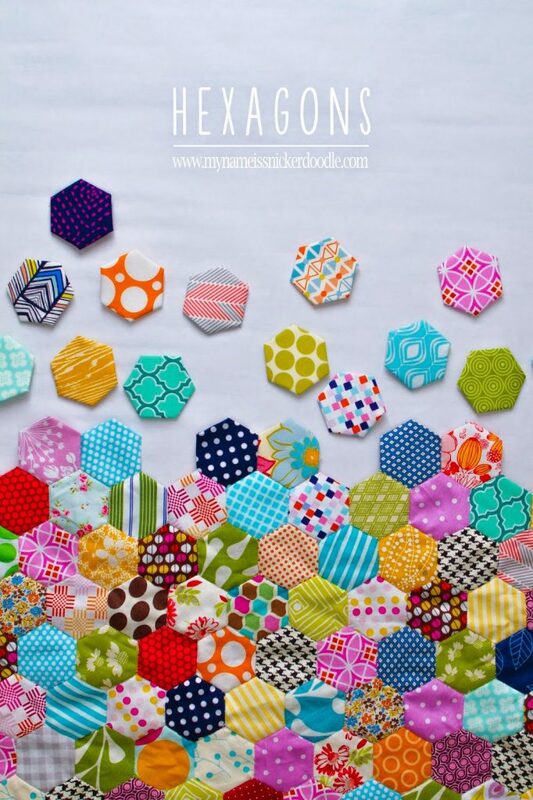 I found this post via Pinterest as I'm getting close to finishing a quilt of my own. It's taken me almost 2 years and I have 30 more flowers to sew together. I have no idea how to go about making it into a quilt yet, but I'll figure that out when I get that far! Did Amy ever post a tutorial? I'm trying to follow the pictures, but I need help! Love it!!!!! 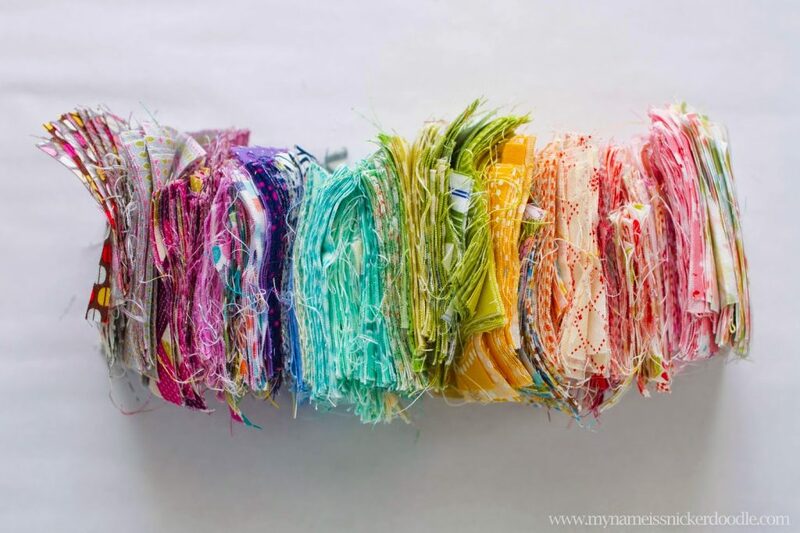 Have you linked up to Kathy's Quilts Slow Stitching Sunday's? Your quilt is absolutely gorgeous! I love the freedom of choice and time constraints! Absolutely freely drop dead gorgeous!!! I sure wish I could give you a better update! It's bigger now, but not quite there yet. I haven't worked on it for months! I have wanted to start crocheting granny squares, but I just cannot seem to make myself pick a color scheme and start. This seems so much better…I can start with whatever fabric I have on hand and get more when I run out. I will definitely be making it for me. 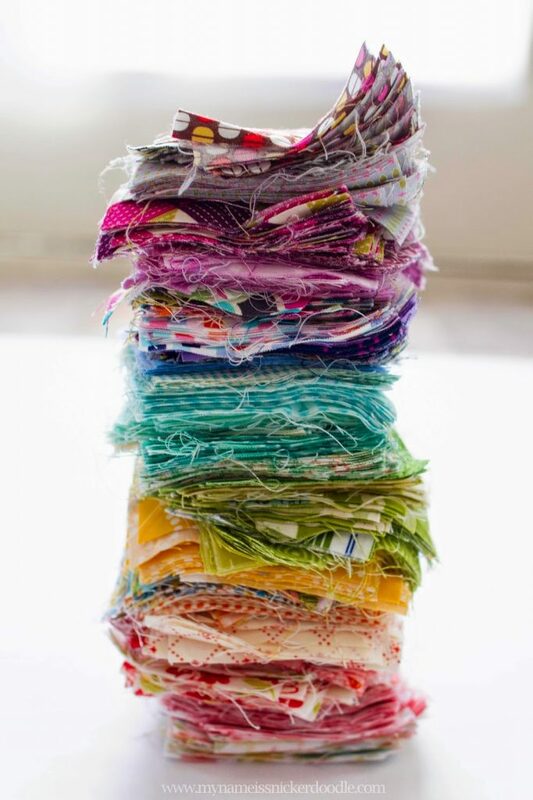 I will definitely try using the totally sentimental fabrics from when my kids were little (I saved the crib sheets and some of their clothes for my imaginary, some day quilt). 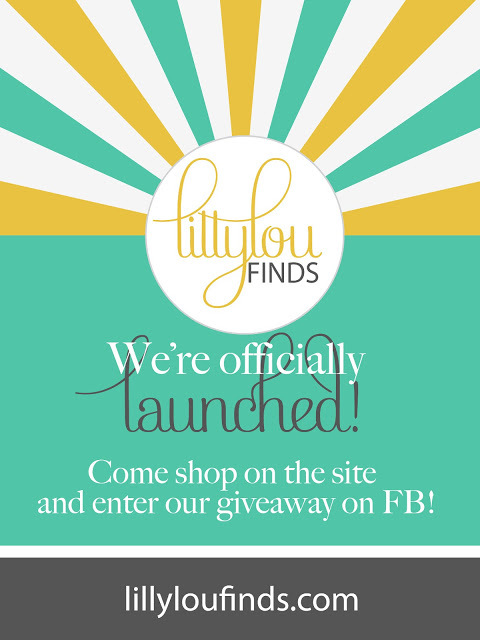 Thank you so much for posting!